Best CD Ripping software to rip CD to MP3, WMA, AAC. iMacsoft CD Ripper (Windows version) is powerful yet easy to use CD ripping software which allows you to extract audio files from Audio CD and rip them to WAV, AAC, AC3, AU, FLAC, M4A, MP2, MP3, OGG, WMA audio formats. It can help you easily retrieve CD information from the CDDB database or rename the CD tracks title and remember them, normalize the output files. 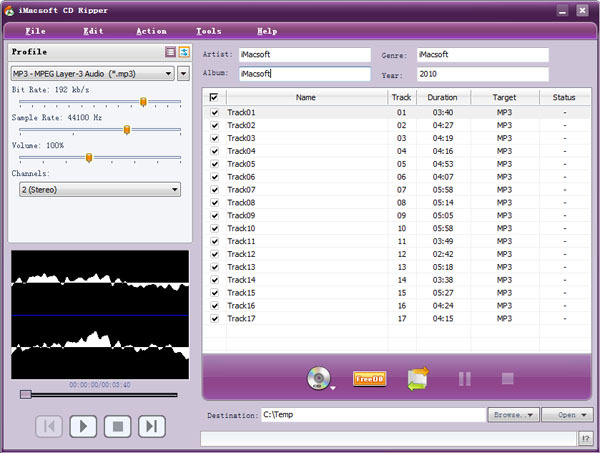 This CD Ripper also provides you with many useful flexible audio-editing options before ripping: you can customize any audio files from CD on your own with some parameters setting, such as audio bit rate, sample rate, volume, and codec. Also let you edit ID3 tag to enrich music library, check and select any CD tracks to convert at your will, and show the music CD tracks automatically for easy to access. Additionally, by using directly digital extraction, pure audio quality is maintained, iMacsoft CD Ripper is also the fastest CD ripper in the world with proprietary optimizing systems. With this CD ripper, you can enjoy CD music files on your computer or upload these CD tracks onto Internet for sharing with your friends. And it offers simple operation and high CD ripping quality and speed. Download it and have a trial right now! How to rip music CD to MP3 audio files?